Do things such as performance indicators, valuation formulas, consumer tests, stock prices or financial contracts represent an external reality? Or do they rather constitute, in a performative fashion, what they refer to? 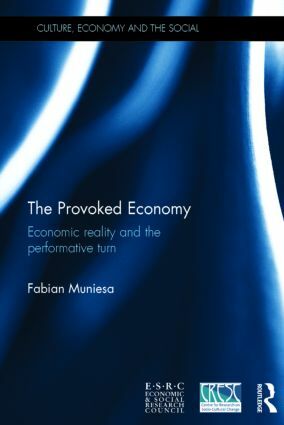 The Provoked Economy tackles this question from a pragmatist angle, considering economic reality as a ceaselessly provoked reality. It takes the reader through a series of diverse empirical sites – from public administrations to stock exchanges, from investment banks to marketing facilities and business schools – in order to explore what can be seen from such a demanding standpoint. It demonstrates that descriptions of economic objects do actually produce economic objects and that the simulacrum of an economic act is indeed a form of realization. It also shows that provoking economic reality means facing practical tests in which what ought to be economic or not is subject to elaboration and controversy. This book opens paths for empirical investigation in the social sciences, but also for the philosophical renewal of the critique of economic reality. It will be useful for students and scholars in social theory, sociology, anthropology, philosophy and economics. Fabian Muniesa is a researcher at the Centre de Sociologie de l’Innovation, École des Mines de Paris. He looks at calculation, valuation and organization from a pragmatist standpoint, with a focus on the problems of business pedagogy, managerial performance, financial innovation and economic reasoning.